hackenslash: Why Are There Still Apes? 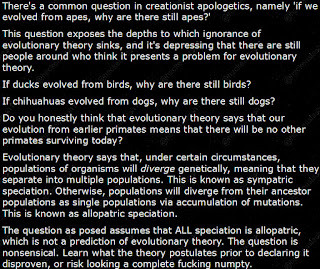 This is probably the most oft-asked question in creationist apologetics and, rather than posing any problem for evolutionary theory, it rightly indicates that some questions are so silly that they can only arise from an ignorance of that which it attempts to pose some sort of gotcha for. The problem is that it indicates a horrible misunderstanding of just what evolutionary theory postulates. Speciation doesn't come in a single flavour. In particular, there are broadly three modes of speciation. The first of these occurs when a single population diverges into multiple populations, often because of some environmental barrier becoming manifest. For example, you could have something as simple as, say, a peninsula becoming an island due to changes in sea level, and then the peninsula being partially covered so that it looks more like an archipelago. Given sufficient reduction in gene flow, the populations can manifest some quite different mutations. Once gene flow is completely cut off by such separation, speciation occurs. This is sympatric speciation. The second mode is when populations diverge genetically from their ancestors, to the degree that, were you to bring members of the child population and the ancestor population together, they would not be interfertile. This is allopatric speciation. The third is very rare, but it occurs when a single population diverges while not subject to any environmental barriers. Generally, their ranges will be adjacent, and models predict that their will often be hybrids at the boundaries. This is parapatric speciation. 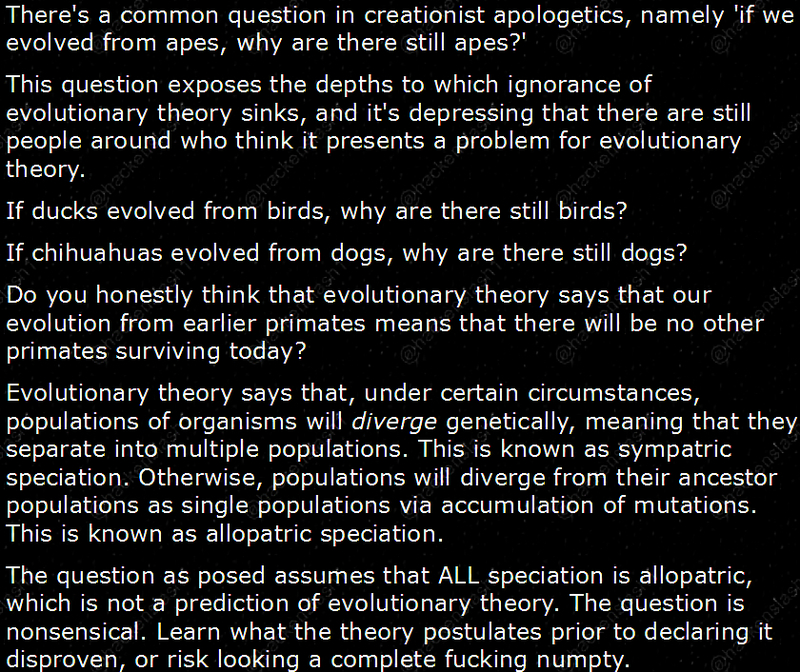 The problem with the question as posed is simply that it resides entirely on the assumption that all speciation is allopatric, which is not a prediction of evolutionary theory. We should also note for completeness that the question is also incoherent for another reason. It asks why the existence of a subset doesn't pose a problem for the set. This is most easily rebutted by asking, "If ducks evolved from birds, why are there still birds?" or "If Americans came from Europe, why are there still Europeans?"